Tense games filled the opening Sunday of the NFL season, as three quarterbacks -- Carson Wentz (Eagles), Jimmy Garoppolo (Patriots) and Dak Prescott (Cowboys) -- made their first career starts. Two of them won, joining Denver quarterback Trevor Siemian, who made his NFL debut Thursday. Both Wentz and Garoppolo showed surprising poise and steadiness during their victories. Prescott, meanwhile, wasn't able to lead the Cowboys to a win against the Giants, but he delivered a credible performance in bringing Dallas within a point of beating their archrivals. Who of the three was best during the opener, though? While we've had some time to digest how Siemian performed since Thursday night, I hustled through the quick turnaround Sunday and rewatched Wentz, Garoppolo and Prescott to get a closer look at where they excelled. To do that, we have to take a look at how the system was built around each of these quarterbacks and what they did to make plays on Sunday. Let's start by taking a closer look in Philadelphia, where the second overall pick made many wonder why he wasn't the first passer off the board in April. Until the Sunday night game, the most shocking starting debut of Week 1 belonged to Wentz. Wentz was expected to begin the year as Philly's third-stringer as recently as two weeks ago, but the Sam Bradford trade and Wentz's recovery from hairline fractures in his ribs were enough to push the North Dakota State product into Philadelphia's starting lineup. Wentz showed he won't be leaving that role anytime soon. Now before saying anything more, it's important to preface discussion of Wentz's performance by noting that he was playing the Browns, who may very well end up as football's worst defense. Six of Cleveland's 11 defensive starters have fewer than 10 career starts to their name, and the most veteran player in the lineup was cornerback Tramon Williams, whom Wentz torched for his first touchdown. Fellow corner Joe Haden took his licks too, surrendering Wentz's second score. While rookies like Carl Nassib and Emmanuel Ogbah flashed for brief moments, the Browns are not a good defense, and we should judge the performance of the Eagles' opponents accordingly. With that caveat, Wentz looked great in his professional debut. He finished 22-of-37 for 278 yards with two scores and zero turnovers -- and I counted four clean drops on a day in which Wentz's passes were often on the money and in safe places. He handled pressure well, moving around effectively inside the pocket while taking just two sacks, one of which was on a busted screen pass that Wentz was smart to eat. You've probably already seen the highlights of Wentz's two big throws, but they're worth recounting in more detail. His first touchdown pass was an absolute dime to Jordan Matthews out of the slot on a fade route in which the Eagles clearly wanted to attack Williams in coverage. Nelson Agholor ran what amounted to a dummy route on the outside to prevent the cornerback from sinking into the corner, Wentz kept the safety in the middle of the field, and the throw was right on time. Easy money. But Wentz had a two-play stretch that was even more impressive. It started with the Eagles leaving him on the field for a fourth-and-4. The Browns sent a big blitz up both A-gaps and got a free rusher in Wentz's face, which sends even veteran quarterbacks into a panic. Wentz immediately targeted his hot read in Zach Ertz, who carried former Eagles safety Jordan Poyer over the line for a first down. There are promising quarterbacks in this league who haven't made a throw that impressive in their entire career. Wentz did it in his first game. For some context, Bradford threw six touchdowns last year on what the NFL defines to be deep passes, which travel 16-plus yards in the air. Wentz threw two in his first game. New coach Doug Pederson didn't put Wentz in a gimmicky offense or simplify the scope of what he might want Wentz to do in the weeks to come. Pederson used some nifty play-calling combinations, like when the Eagles ran a pitch to the left side for a first down and played off it on the very next play, with Wentz planting his foot for the pitch before turning the other way for a bootleg and an easy completion to Ertz. In the shotgun, Pederson installed several RPOs (run-pass options) with Wentz seemingly reading a linebacker at the second level to decide whether he should hand the ball off to his running back or hold the ball for a passing play. (Wentz ran similar RPOs occasionally at North Dakota State.) Late in the game, they ran an RPO in which Wentz got to choose between a running play, screen or slant, correctly opting for the slant to Matthews. It would be wrong to say Wentz was perfect, of course. He held the ball too long on a third-down sack deep in Cleveland territory, and the yardage lost ended up being just enough for Caleb Sturgis' field goal attempt to swing wide. A lazy throw on a screen was knocked away by Ogbah. On the busted screen play mentioned earlier, he probably should have thrown it away instead of taking the sack. 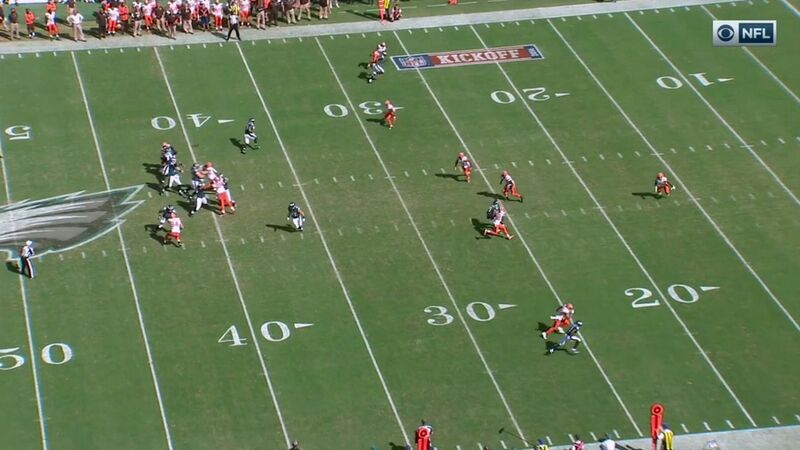 He picked up an early first down with a hard count, but then later was called for a false start himself. If these are the problems after Week 1, though, the Eagles can hardly complain. It was a very promising start for Philadelphia and its new quarterback. Prescott managed to finish without taking a sack or giving the ball away and was impacted by several drops, but his overall performance was nothing spectacular. He finished 25-of-45 for 227 yards, completing under 56 percent of his passes while averaging just over 5 yards per attempt. To put that in context, Prescott was the 100th quarterback to throw exactly 45 passes in a game since 2005. Prescott's completion percentage tied for 76th among those 100 passers. His yardage total tied for 93rd. He was unproductive for throwing such a high number of passes. There were glimpses of the Prescott who blew up in August, but mostly, he was at the helm of a relatively conservative scheme. The new-look Giants defense did an excellent job in run defense, holding Ezekiel Elliott to 51 rushing yards on 20 carries, leaving Prescott in too many third-and-longs. His third-down attempts came with an average of 9 yards to go, and given those restraints, Prescott and his receivers did well to pick up more than half of those conversions when you include penalties. The Giants clearly came into the game with a plan of taking Dez Bryant away and forcing Prescott to throw to his other options, and indeed, Bryant finished with just one catch on five targets for 8 yards, including a semi-drop in the end zone on one of Prescott's better passes of the day. The Giants went with heavier doses of zone coverage early, eschewing blitzes while their linebackers read the run before dropping into deeper zones designed to take away intermediate dig and curl routes. It was only later in the game and in more passing-specific situations that they started to blitz and go with more man coverage, albeit almost always (judging from the broadcast tape) with safety help leaning Dez's way. As a result, Prescott was stuck with a long day of throwing option routes, hitches and drag routes to Cole Beasley and Jason Witten. They were targeted on 26 of Prescott's 45 pass attempts, and the duo gained 131 of his 227 yards. These were often safe, uncontested throws to open targets. Prescott and Beasley should have hooked up for a touchdown when Beasley came open on a blown coverage in the first half, but Prescott lofted the throw too high and it bounced off Beasley's hands. When the Giants didn't need to drop their safeties deep in the red zone, the field shrunk and Prescott didn't have safety valves for easy completions. That has to be disconcerting, and making completions in tighter windows without risking interceptions is a dangerous and difficult game Prescott will have to play. The Cowboys turned their three red zone trips into a total of 13 points, an inefficient performance that ended up costing them the game. The Giants turned their three red zone trips into 21 points. Perhaps most disappointingly, despite an erratic-at-best pass rush from the Giants, we saw little of the dynamism that seemed to surround every Prescott snap during the preseason. He used his feet to avoid pressure effectively, but he only ran the ball twice, once on a broken play and the other as part of a read-option keeper for 11 yards. Prescott's average pass traveled 8.8 yards past the line of scrimmage per ESPN Stats & Information's charting, but he wasn't often successful throwing downfield. On passes the NFL classifies as deep, Prescott went just 1-of-9 for 21 yards, the lone completion coming on this bootleg and flick of the wrist to Geoff Swaim for 21 yards. As for the final play of the game, when Prescott threw a short pass to Terrance Williams, I'm skeptical that the fourth-year wideout's baffling decision to stay inbounds really cost Dallas a serious shot at winning the game. Nobody can doubt that it was shortsighted, of course, but the Cowboys were all but already eliminated from the contest. Watch that final pass again, and you'll see that Williams catches the ball at the 47-yard line with about 10 seconds to go. It would probably take about two seconds to get out of bounds even if he instantly made it without any tackle attempt from the Giants. Let's say he could have stopped the clock with eight seconds to go. The Cowboys still can't kick from there; Bailey would be attempting a 65-yard field goal, which even for a good kicker is going to be a miracle. Likewise, if Dallas wants to take a shot at the end zone, they're looking at a Hail Mary. Despite what Aaron Rodgers might tell you, the chances of converting on a Hail Mary are somewhere around 1-2 percent. Dallas' best hope, then, would have been for Williams to get out of bounds, allowing Prescott to throw another short pass, get a receiver out of bounds again, and set Bailey up for a long field goal, likely in the 57-yard range. It's not impossible for Bailey to hit from that range -- indeed, he had hit a 56-yarder earlier in the game -- but that's a tall order to ask of any kicker, and it assumes that the Cowboys executed perfectly in getting to the point where Bailey could attempt his kick. As the Williams play itself showed us, that's not always the case. I ran this in Brian Burke's win expectancy simulator (which now powers the win expectancy models at ESPN.com), and it suggested that even if Williams had managed to make his way out of bounds, the Cowboys would have had just a 7 percent chance of winning. Even if you give them a few extra points for running out one of the league's best kickers in Bailey, their chances were still extremely slim. The night belonged to New England's new starter. While Garoppolo is not a rookie, his professional career before Sunday consisted of 31 passes over two seasons, most in situations in which the debate of winning and losing had long been settled. This was a trial by fire. It wasn't just Garoppolo on the road against a defense that finished third in DVOA in 2015 and addressed its weakest spot in the offseason by adding one of the Patriots' best defenders, Chandler Jones. It was Garoppolo without his best receiver (Rob Gronkowski), best running back (Dion Lewis), and both starting tackles (Nate Solder and Sebastian Vollmer). Guard Jonathan Cooper was the fifth would-be starter missing from the lineup on offense. And the Patriots won anyway. While the Patriots were aided by a well-timed holding penalty and a botched potential game-winning field goal by Chandler Catanzaro on the final drive, they couldn't have beaten the Cardinals without an effective game from Garoppolo, who delivered. He wasn't Tom Brady, but the Eastern Illinois product was able to execute a ruthlessly concise game plan from Bill Belichick and offensive coordinator Josh McDaniels. The Patriots undoubtedly had to change some things with the late unavailability of Gronkowski and Solder, but their scheme was a credit to how the Patriots exploit weaknesses in even great teams. On Sunday night, Arizona's weakness was in its secondary. While Tyrann Mathieu returned to the lineup after tearing his ACL late in the 2015 season, the Cardinals deployed him almost exclusively in deep coverage over the top as a free safety instead of moving him closer to the line of scrimmage. The tactic worked in the sense that Garoppolo never really threw deep over the middle of the field, but it also suggests that the Cardinals aren't entirely confident in Mathieu's health this early in the season. Instead, the Patriots went after the weakest points in Arizona's secondary. In some spots, that was hybrid defensive back Tyvon Branch, signed away from the Chiefs this offseason and in line to play the sort of position-shifting role Mathieu had in years past. And at cornerback, with Jerraud Powers now in Baltimore and Mathieu limited by his health, the team turned to rookie cornerback Brandon Williams, a third-round pick who was a running back at Texas A&M until last season. In much the same way that McDaniels ruthlessly went after desperately overmatched Baltimore cornerback Rashaan Melvin during the 2014 playoffs in New England's comeback win, he built a game plan around attacking Arizona's softest spots. The very first play of the game appeared to be a play-action pass with a deep out against Branch built in, only for Garoppolo to make one of a precious few missteps in missing the pass to an open Chris Hogan. Both Danny Amendola and Julian Edelman would make catches against Branch, while a defensive pass interference penalty on Branch that would have put the ball on Arizona's 1-yard line was nullified by one of New England's four offensive holding calls. Hogan would be the first of many to have his moment in the sun on Sunday against Williams, who was burnt to a crisp in his first NFL start. It's always exceedingly difficult to diagnose NFL coverages without knowing the play call, especially without coaches' tape, but it seemed pretty clear that Williams often wasn't on the same page with the rest of the defense. The most obvious example was on Garoppolo's first touchdown pass of the year, a 37-yard bomb to a wide-open Hogan. The newly signed WR was totally unmarked because of clear miscommunication in the Arizona defense. Instead of running upfield with his man, Williams took just a couple of steps with Hogan before releasing the wide receiver and turning back toward the quarterback, suggesting that he thought he had help from a deep safety. Sadly, the Cardinals had rolled just a single-high safety to the middle of the field, and he was distracted by three Patriots receivers on the other side, leaving a breezy pitch-and-catch for Garoppolo and a wide-open Hogan. It was the start of a brutal day for Williams. He appeared to blow another coverage later in the half, carrying a slant in man coverage while the rest of the defenders on his side played a softer zone. The result: a 19-yard gain for Hogan. Then, on a critical third-and-7 just outside the red zone in the third quarter, Williams tried to jump a stick route and broke too late, missing out on both the ball and the tackle as Malcolm Mitchell gained 28 yards, with the Patriots scoring on the next play. Mistakes by Williams set up each of Garoppolo's first two touchdowns. From that point forward, the next two drives were all about picking on Williams or scaring the Cardinals into thinking they were trying to pick on their rookie corner. McDaniels built in some nifty play designs to help, like when the Patriots went with three wideouts to the opposite side of the formation to push Williams into the slot against Edelman and then motioned Edelman back to that opposite side of the formation, effectively isolating him against the rookie. The pass interference call on Branch and a first down against Williams were both wiped out by holding penalties, but the path the Patriots had chosen was clear. By the time the Cardinals adjusted and went to more zone, the Patriots had done just enough to stay in the game and caught a couple of breaks. When the fake screen-and-go combo they dialed up on third-and-15 was sniffed out, Arizona's pass rush faltered and Garoppolo did his best Russell Wilson impersonation in extending the play before finding an open Amendola downfield for a first down. Later, when the Pats had third-and-11 on the edge of field goal range, they called for a draw in the hopes of creating a more manageable kick, only for LeGarrette Blount to rumble for 12 yards and convert, a move so surprising that the Patriots picked up a delay of game immediately afterward. Garoppolo and McDaniels combined to piece together a game plan out of the scraps they had on offense. James White played a bigger role, with the Patriots even splitting him out as a wide receiver and isolating him against safeties on slants, just as the Cardinals were doing the same thing with their halfback, David Johnson, repeatedly throughout the game. Gronkowski's absence led to more playing time for FB James Develin, as the Patriots ran heavily behind Bennett, who was excellent as a run-blocker and a useful mismatch as a receiver. McDaniels used an early jet sweep with Edelman as the basis for moving Edelman around the formation as a threat the Cardinals had to honor. He caught all seven of the passes Garoppolo threw to him for a total of 66 yards. The biggest concern with Garoppolo was very reasonable given his lack of experience: He still doesn't have a great feel for pressure. While he did make a couple of nifty moves to get away from a steady stream of Cardinals blitzers, Garoppolo had a few plays in which he didn't sense the rush and either had to panic to get the ball away or was hit as he tried to do so. He lost a fumble on third down when the move would have been to take a sack and punt. It would be insane to expect Garoppolo to handle pressure as well as Brady in his first career start, but it's a clear place for likely growth in the weeks to come. Which of the three played best in Week 1? Without adjusting for degree of difficulty, it's fair to say that Wentz looked the best, given how smooth he was in and around the pocket and the quality of his throws downfield. After you consider the quality of the opposition and the talent missing from his lineup, though, I think most would give the nod to Garoppolo, who became just the fourth quarterback (after Wilson, Colin Kaepernick and, somewhat bizarrely, Nick Foles) to beat Bruce Arians in Arizona. He'll have it far easier in the weeks to come, given that the Pats now get the Dolphins, Texans and Bills at home before Brady comes back in Week 5. There isn't going to be a quarterback controversy in Foxborough, but Pats fans can have even more confidence that they'll be able to get by until Brady returns and hope for what the future will look like after Brady leaves for good.